Why is it important for African-American women to use natural products on their skin, hair and bodies? The question might be answered by making sure you know natural products are important for ALL types of bodies and skin. Think about how most of our environment is overly-processed today. From the technology we can't seem to live without to the fast-food and pre-cooked meals many people eat. Even to the silicone's and ingredients we use in products to make us look better, we are constantly bombarding our bodies with man-made greatness�but what about Mother Nature and her greatness? It's time to get back to basics and the easiest way to do that is to start with yourself and the products you use on a daily basis to replenish and beautify. African-American skin is glorious in all of its darker beauty, and its essence should shine through with natural products that complement and take care of your body. Start with your hair by using natural products that will penetrate the hair shaft and not just coat it with chemicals. African-American hair can lean towards the very dry or very oily, so choose products that will address those issues. Using a shampoo and conditioner with naturally infused peppermint will cool and soothe an irritated scalp. Hair creams and butters that use natural ingredients and melt in your hand will make you feel like the Queen that you are. When it comes to your face, always use a moisturizer with a sun protection factor (SPF). Yes as an African-American you should limit your time in the sun and those glorious rays of sunshine. And when you do get exposure some type of sun protection should be used. Moisturizers enriched with vitamins will nourish and treat your skin. Vitamin C is a natural antioxidant that helps to reduce sun damage to the skin as it penetrates by working with the cells in your skin. 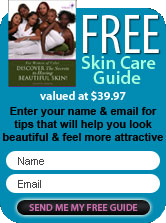 It is also known to assist in slowing down the "free radicals" that wreak havoc on your skin. Vitamin C stimulates the production of collagen which can help to reduce fine lines and wrinkles. Hyaluronic acid might sound like a chemical, but it's not. It's actually a liquid substance that is found within our bodies. It has been shown that it can act as a filler and assist in replenishing lost moisture. A skin smoother that isn�t too heavy on your skin, you want that glow without any barriers. Using it as an added ingredient in face serums and lotions can act to help you in your quest to slow the signs of aging on your face. Gentle Treatments for Natural Black Skin For the rest of your body, treat it gently. Your skin is the largest organ, larger than your heart, and it should be treated with the best natural ingredients for African-American skin. If you want to worship your skin, treat yourself to lotions and creams with jojoba oil. I's been likened to our own natural skin oils and a little goes a long way. Use it in your everyday lotion and even treat yourself (or someone else!) to its benefits by enjoying massage oils infused with it. You will find that your African-American skin can breathe and look beautiful by making the choice to use natural skin care products.